The aim of this page is to demonstrate some simple uses of the distributions available from the distributions.py module available at pycbc.distributions. Here we will demonstrate how to make different mass populations of binaries. 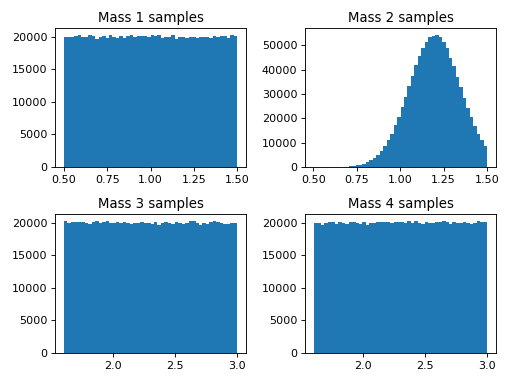 This example shows uniform and gaussian mass distributions. # Take 100000 random variable samples from this uniform mass distribution. 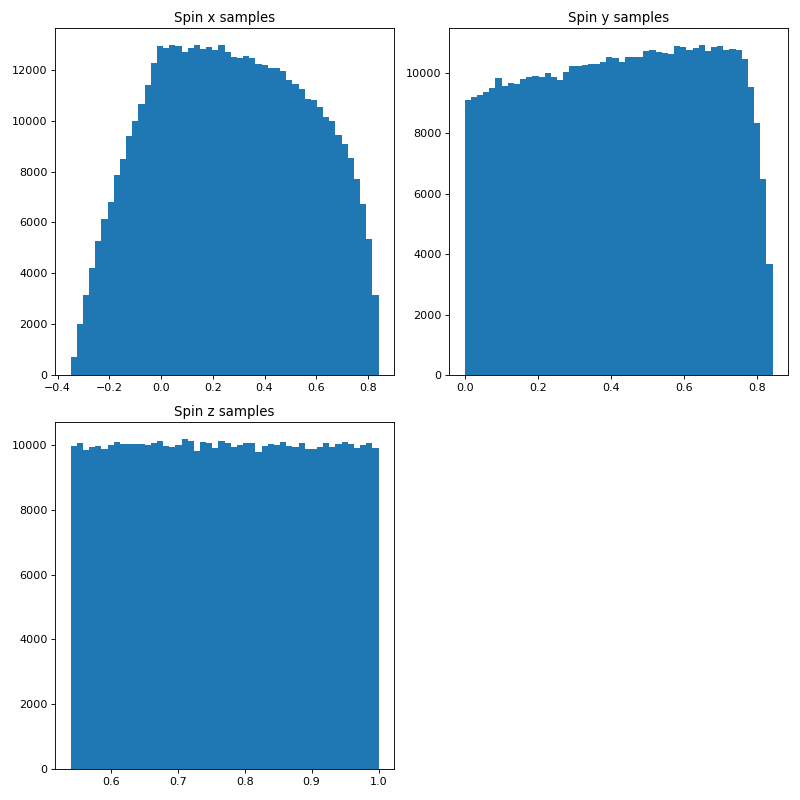 # Take 100000 random variable samples from this gaussian mass distribution. # We can make pairs of distributions together, instead of apart. # Choose 50 bins for the histogram subplots. Here we can make a distribution of spins of unit length with equal distribution in x, y, and z to sample the surface of a unit sphere. # phi = azimuthal_ bound(phi_lower_bound to a phi_upper_bound). # case we want 50000 samples. # Make spins with unit length for coordinate transformation below. # Choose 50 bins for the histograms. 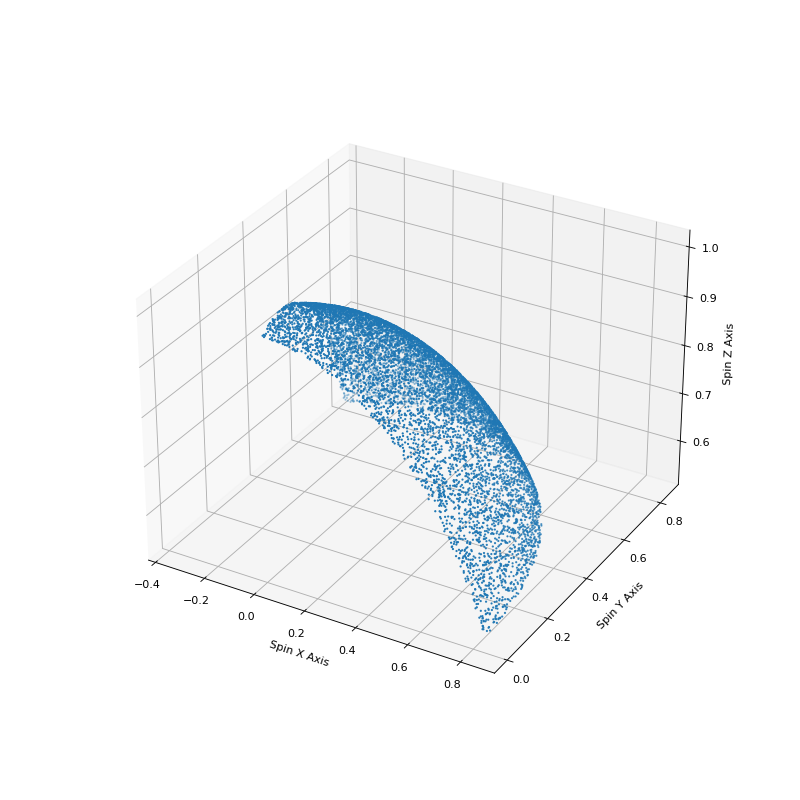 Using much of the same code we can also show how this sampling accurately covers the surface of a unit sphere. # of pi so we use between 0 and 1. # Units of pi for the bounds of the azimuthal angle which goes from 0 to 2 pi. # phi = azimuthal_bound(phi_lower_bound to a phi_upper_bound). # Now we can take a random variable sample from that distribution. # In this case we want 50000 samples. # 3rd dimension for a 3D plot that we make later on. # convert from spherical polar coordinates to cartesian coordinates. # distributed across  the surface of a sphere.